A simple Half Wave Rectifier is nothing more than a single pn junction diode connected in series to the load resistor. As you know a diode is to electric current like a one-way valve is to water, it allows electric current to flow in only one direction. This property of the diode is very useful in creating simple rectifiers which are used to convert AC to DC. If you look at the above diagram, we are giving an alternating current as input. Input voltage is given to a step-down transformer and the resulting reduced output of the transformer is given to the diode ‘D’ and load resistor RL. The output voltage is measured across load resistor RL. Simply put, a half wave rectifier removes the negative half cycle of an AC input and allows only the positive cycles to pass creating a DC flow. To understand the operation of a half wave rectifier perfectly, you must know the theory part really well. If you are new to the concepts of a PN junction and its characteristics, I recommend you to read the half wave rectifier theory part first. The operation of a half wave rectifier is pretty simple. From the theory part, you should know that a pn junction diode conducts current only in 1 direction. In other words, a pn junction diode conducts current only when it is forward biased. The same principle is made use of in a half wave rectifier to convert AC to DC. The input we give here is an alternating current. This input voltage is stepped down using a transformer. The reduced voltage is fed to the diode ‘D’ and load resistance RL. During the positive half cycles of the input wave, the diode ‘D’ will be forward biased and during the negative half cycles of input wave, the diode ‘D’ will be reverse biased. We take the output across load resistor RL. Since the diode passes current only during one-half cycle of the input wave, we get an output as shown in the diagram. The output is positive and significant during the positive half cycles of the input wave. At the same time output is zero or insignificant during negative half cycles of the input wave. This is called half wave rectification. Explaining Half Wave Rectification in academic words! When a single rectifier diode unit is placed in series with the load across an ac supply, it converts alternating voltage into a uni-directional pulsating voltage, using one-half cycle of the applied voltage, the other half cycle being suppressed because it conducts only in one direction. Unless there is an inductance or battery in the circuit, the current will be zero, therefore, for half the time. This is called half-wave rectification. As already discussed, a diode is an electronic device consisting of two elements known as cathode and anode. Since in a diode electrons can flow in one direction only i.e. from the cathode to anode, the diode provides the unilateral conduction necessary for rectification. This is true for diodes of all types-vacuum, gas-filled, crystal or semiconductor, metallic (copper oxide and selenium types) diodes. Semiconductor diodes, because of their inherent advantages are usually used as a rectifying device. However, for very high voltages, vacuum diodes may be employed. The half-wave rectifier circuit using a semiconductor diode (D) with a load resistance RLÂ but no smoothing filter is given in the figure. The diode is connected in series with the secondary of the transformer and the load resistance RL.Â The primary of the transformer is being connected to the ac supply mains. The ac voltage across the secondary winding changes polarities after every half cycle of the input wave. During the positive half-cycles of the input ac voltage i.e. when the upper end of the secondary winding is positive w.r.t. its lower end, the diode is forward biased and therefore conducts current. If the forward resistance of the diode is assumed to be zero (in practice, however, a small resistance exists) the input voltage during the positive half-cycles is directly applied to the load resistance RL, making its upper-end positive w.r.t. its lower end. The waveforms of the output current and output voltage are of the same shape as that of the input ac voltage. During the negative half cycles of the input ac voltage i.e. when the lower end of the secondary winding is positive w.r.t. its upper end, the diode is reverse biased and so does not conduct. Thus during the negative half cycles of the input ac voltage, the current through and the voltage across the load remains zero. The reverse current, being very small in magnitude, is neglected. Thus for the negative half cycles, no power is delivered to the load. Rectification is an application of the pn junction diode. A half wave rectifier is a device which makes use of key properties of a pn junction diode. So to understand the underlying theory behind a half wave rectifier, you need to understand the pn junction and the characteristics of the pn junction diode. We have developed two articles to help you understand both of them. 1)Understanding the PN Junction Â – This article will help you to understand the pn junction and the underlying theory behind using PN junction as a rectifier. 2) Characteristics of PN junction diode – This article will help you to understand the characteristics of a pn junction diode with help of graphs. You can understand the behavior of a diode across various voltage levels and how it conducts. The most important characteristics which areÂ requiredÂ to be specified for a power supply are the required output dc voltage, the average and peak currents in the diode, the peak inverse voltage (PIV) of Â diode, the regulation and the ripple factor. A half wave rectifier is rarely used in practice. It is never preferred as the power supply of an audio circuit because of the very high ripple factor. High ripple factor will result in noises in the input audio signal, which in turn will affect audio quality. The advantage of a half wave rectifier is only that its cheap, simple and easy to construct. It is cheap because of the low number of components involved. Simple because of the straight forwardness in circuit design. Apart from this, a half wave rectifier has more number of disadvantages than advantages! 1. The output current in the load contains, in addition to dc component, ac components of basic frequency equal to that of the input voltage frequency. Ripple factor is high and an elaborate filtering is, therefore, required to give steady dc output. 2. The power output and, therefore, rectification efficiency is quite low. This is due to the fact that power is delivered only during one-half cycle of the input alternating voltage. 3. Transformer utilization factor is low. 4. DC saturation of the transformer core resulting in magnetizing current and hysteresis losses and generation of harmonics. The output of half wave rectifier is not a constant DC voltage. You can observe from the output diagram that its a pulsating dc voltage with ac ripples. In real life applications, we need a power supply with smooth waveforms. In other words, we desire a DC power supply with the constant output voltage. A constant output voltage from the DC power supply is very important as it directly impacts the reliability of the electronic device we connect to the power supply. We can make the output of half wave rectifier smooth by using a filter (a capacitor filter or an inductor filter) across the diode. Â In some cases, a resistor-capacitor coupled filter (RC) is also used. The circuit diagram below shows a half wave rectifier with capacitor filter. Peak Inverse Voltage (PIV) rating of a diode is important in its design stages. It is the maximum voltage that the rectifying diode has to withstand, during the reversely biased period. Rectification efficiency is defined as the ratio between the output power to the ac input power. The maximum efficiency that can be obtained by the half wave rectifier is 40.6%. This is obtained if RF is neglected. Ripple factor is in fact a measure of the remaining alternating components in a filtered rectifier output. It is the ratio of the effective value of the ac components of voltage (or current) present in the output from the rectifier to the dc component in output voltage (or current). Where, I1,I2, Â I4 and so onare the rms values of fundamental, second, fourth and so on harmonics and I2acis the sum of the squares if the rms values of the ac components. Fror an ideal power supply, the output voltage should be independent of load current and the percentage regulation should be equal to zero. Any rectifier is used to construct DC power supplies. The practical application of any rectifier (be it half wave or full wave) is to be used as a component in building DC power supplies. Â A half wave rectifier is not special than a full wave rectifier in any terms. 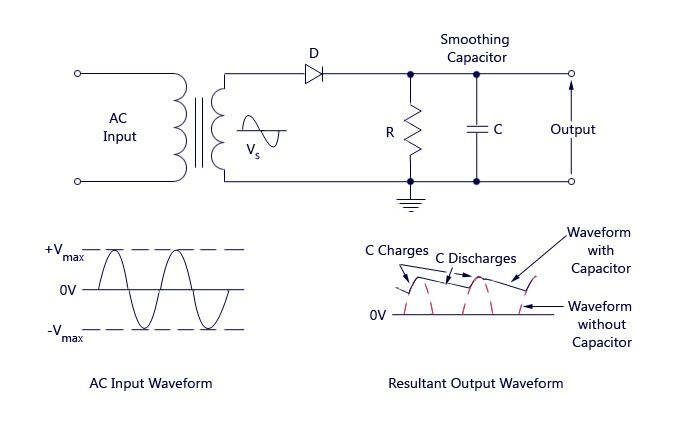 In order to build an efficient & smooth DC power supply, a full wave rectifier is always preferred. Â However, for applications in which a constant DC voltage is not very essential, you can use power supplies with half wave rectifier. Quite precise and so enlightening…. The piece provides the basics needed to comprehend the application of diodes in rectification. why 4 diode bridge rectification gives half wave form using frequency generator instead of transformer ? using transformer , we get full wave . I iss nic one but but diagrams are less in no. a lot of thanks to help me….. really it is too good,,,,students must prefer this site to clear their doughts ……… I’m speechless …….. i ‘ll suggest my all friends to click upon this site … so they can also clear their topics … THANKS AGAIN. give some example about Half Wave Rectifier. AC Power Surge impact(s) to the diode of a half wave rectifier: Is it typically the Voltage surge or the Current that damages the diode and filter caps, and why? Oh god i finally understood it .. Damn .. U made it in such simple words ! It seems odd that you haven’t shown use of a second diode for half wave rectification……unless 2 diodes are a primitive form of full wave? I’m not remembering my theory very well but am trying to brush up! Use of 2 diodes is definitely one way it’s occasionally done even in expensive test equipment. i need the complete article and video ASAP ..
We will edit this article very soon. In the edited version, you can expect half wave rectifier equations, formula and a simulated video. could you please add a tabular column of expected values..
so that we will have a clear picture about the experiment..
article is good but its required to be in a bit simplr english and use of more convenient and more simpler words for better understanding of the concepts..
or else the explanation is much better than that given in NCERT text books. The lines are very easily. The matter is very nice and this is sufficient for basic idea.It should be better to give a designing of half wave rectifier along with theory part.and it need to update with latest technology i.e now what are the applications of half wave rectifier and what are the implementations from half wave rectifier etc..
how a question is completed without diagram.where is the diagram of Half wave rectifier.please send the circuit diagram of it………. It has realy helpd me..thank u nd we need more! it is good work,but it is better to add diagram for more elaboration. thank u 4 helping me at the tyms when the last date of submission was on ma head & ma teacher was after me abut dis project. good job sir , but i want above basics concept of electronics. and also, i want above, more electronics circuit diagrams. is this how a semiconductor diode can be used as a half wave rectifier? I’m not really to sure, so can someone please tell me. the given material about half wave rectifier very helpful for student. very good matter please post the latest matter about rectifiers and electronic components.